One of the largest in the world. 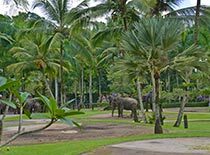 Activity Elephant Safari Park of Bali Adventure Tours is located in Taro, north of Ubud which has about 29 elephants. 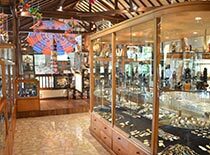 Acclaimed as the World’s Best Elephant Park, facilities include a museum with a large collection of elephant memorabilia. 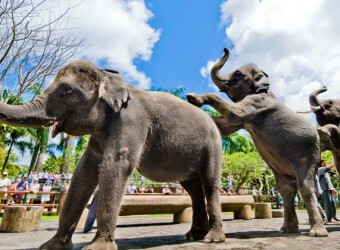 Here you can meet baby elephants which were born on March and April 2009 ! 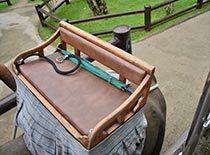 ・We offer the special price for “Entrance the Park and Safari Ride 30minutes Package” when you apply Car Charter at the same time. If you wouldn’t apply Car Charter, we cannot take the reservation of this package. Activity Combination from Bali Adventure Tours! 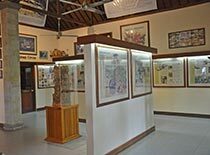 Activities start in the afternoon, 3 activities a day is also available. Please see activity page for more details! 10：00 Arrive at rafting start point. Changing, preparing and lecture. ※The schedules might change due to traffic jam. 13：30～14：15 Arrive at rafting start point. Changing, preparing and lecture. ※ The schedules might change due to traffic jam. 9：30～10：00 Arrive at cycling start point. Choosing a bicycle, preparing and safety lecture. 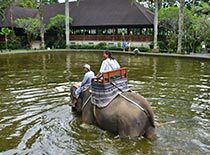 10：00～12：00 Visit traditional Balinese villages, farms and rice terraces. 15：00～15：30 Arrive at cycling start point. Choosing a bicycle, preparing and safety lecture. 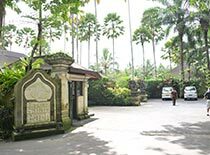 15：30～17：30 Visit traditional Balinese villages, farms and rice terraces. 9：30 Stop for a restroom at elephant park. Sign the agreement. This is the cheapest price that we can offer! Specialists’ menu covers all 3 activities!! 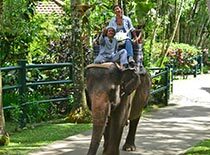 Is it same afternoon Elephant ride and night Elephant ride? What we can see in the park? 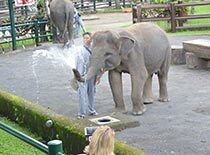 Watch Elephants bathing, baby Elephants etc. This activity is suitable for people between the ages of 1 and 75. How about the rainy day? Umbrellas are available in the park. Comfortable shoes or sandals, Sunblock, Camera, Money for drink etc. 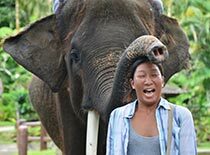 It was the first time for me to ride an elephant. It was exciting. Elephant is so cute, there was plenty of time petting and feeding. We had lunch at the open ceiling restaurant with beautiful view. It was delicious! Cost performance is quite high.